Chronological list of online resources that have informed the decisions (assumptions) made for the diagram (Img. _01 based on Horwood's map from 1799) and other maps of London from the 17th and 18th century. 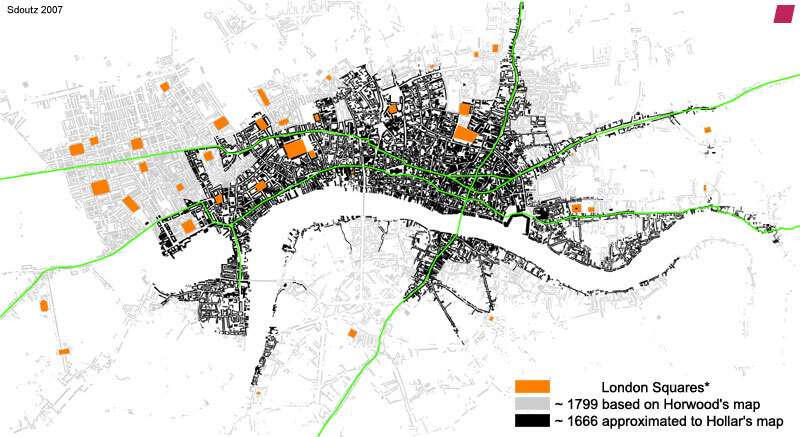 "Squares" in the above diagram SIMPLY include all urban spaces with "square" in their name by 1799. Therefore excluding all "places" "courts", "yards" "grounds" "greens" "gardens" "walks" "malls" "fields", "parks", "markets" "wharfs" "closes" … namely different spaces - with an assigned (primary) function, other than that of the formal residential square. With the notable exception of: Covent Garden (Westminster), Hans Place (Kensington), Lincolns Inn FIelds (Lincoln's Inn Fields - Camden Town) and Moor Fields (Moorfields / Finsbury Circus - City). Thus the English (!) language hints at formal and functional aspects when denoting [bedeuten] a square. This excludes all 'irregular' spaces (even though sometimes pronounced squares) that lack(ed) any apparent geometrical intent. I.e. St. Johns Square (Saint John's Square - Clerkenwell), Gough Square (City), West Smithfield (W Smithfield - City), The Mall, The Strand (Strand - Westminster), […]. 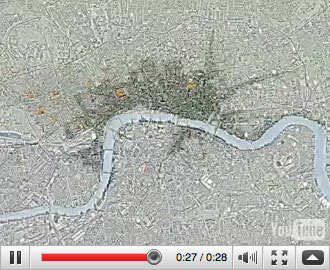 Devonshire Square (City), Cox's Square (City), Haydon Square (City), America Square (City), New Square (City), Printers Square (City), Gun Square (Aldgate, City), Sion Square (Poplar), Audley Square (Westminster), Canterbury Square (Camberwell) […] are (were) too small to be shown in this diagram; marking scale the 3rd aspect. It is also unaware of spaces, 'intuitively' attributed to and prerequisited for certain typologies: such as hospitals, houses [palaces], inns, convents, mews, […]. Attributing the notion of public domains (versus private spaces) would not apply, for these squares were not necessarily meant for and accessible to 'a general public'. » The English square, […] was merely a place where many people of the same class had their houses and it was therefore perfectly in keeping that it should be like the courtyard of a convent. « I.) 1 Acknowledging the social aspect. See https://youtu.be/ for larger player. William Morgan, 'London &.c. Actually Survey'd by Wm. Morgan, His Matie's Cosmogr.' 1681-1682 [offline] extract ? 'Collect Britain' has moved to 'Crace Collection of Maps of London'. All links have been updated with a view added. (22nd of December 2008).